Inflation in the food articles basket rose to 5.68 per cent during March 2019 as against 4.28 per cent in February, as prices of vegetables jumped, government data showed Monday. Wholesale Price Index (WPI)-based inflation rose to a three-month high of 3.18 per cent in March on costlier food and fuel items. Yet, several analysts still expect the Reserve Bank of India to cut policy rates by another 25 basis points (bps) as headline inflation remains within the RBI’s medium-term target range. Inflation in the food articles basket rose to 5.68 per cent during March 2019 as against 4.28 per cent in February, as prices of vegetables jumped, government data showed Monday. Food articles’ inflation has been rising steadily for the last five months. Inflation in the fuel and power category also rose to 5.41 per cent, from 2.23 per cent in February. The WPI-based inflation was at 2.93 per cent and 2.76 per cent in February and January this year, respectively, and 3.46 per cent in December 2018. It was 2.74 per cent in March last year. Vegetable inflation was at 28.13 per cent in March this year, up from 6.82 per cent in the previous month. However, inflation in potato cooled substantially to 1.30 per cent, from 23.40 per cent in February. “Like in the previous month, higher food inflation in combination with fuel and power provided impetus to the wholesale inflation. The bigger push however came from food articles where several items — namely wheat, jowar, bajra, maize, barley — have been witnessing double digit or near double digit inflation since November 2018. Pulses also recorded second consecutive month of double digit inflation in March 2019. Within pulses, arhar and moong have now witnessed four month of consecutive double digit inflation,” said Sunil Kumar Sinha, principal economist at India Ratings and Research. 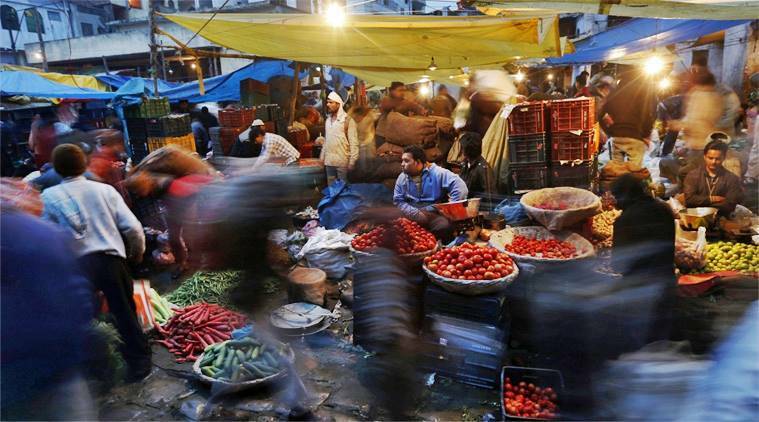 Rising food and fuel prices pushed up wholesale price index-based inflation to a three-month peak. Higher wholesale prices spill over onto retail prices with a lag, but analysts expect CPI-based inflation remain within the RBI’s comfort zone of 4 per cent during the year. Unless global crude prices bump up sharply, overall inflation is expected to remain benign, allowing the central bank to reduce interest rates by another 25 bps in the first half of the current fiscal. The deflation witnessed in the perishable food items like vegetables since July 2018 till January 2019 turned into inflation in February 2019. This jumped to a whopping 28.1 per cent in March 2019. Such an abrupt reversal in vegetable prices especially during the summer month is not new. “With the probability of El Niño looming on monsoon in 2019, inflation management may once again become a challenging task for the policy makers. However, today’s India Meteorological Department’s forecast of a ‘near normal’ monsoon in 2019 should ease some pressure on this front. Also the manufacturing and core inflation continues to be benign,” Sinha added. Inflation in diesel shot up to 7.33 per cent in March from 3.72 per cent in February. In petrol, inflation was 1.78 per cent in March, as against a deflation of 2.93 per cent in the previous month. The RBI, which mainly factors in Consumer Price Index (CPI)-based inflation for monetary policy decision, had earlier this month cut interest rates by 25 bps to 6 per cent, while projecting retail inflation to be at 2.9-3 per cent, primarily on the back of lower food and fuel prices as well as normal monsoon. Data released last week showed CPI-based inflation accelerated to 2.86 per cent in March from 2.57 per cent a month ago. “On policy front, we see another 25 bps cut in H1FY20, most possibly in June itself, especially amid current global goldilocks situation. However, the MPC (Monetary Policy Committee) may choose to wait and assess the full-year budget in July and this may delay the rate cut to Q2FY20. The bar for further cuts will be a much higher and will be data-dependent,” said Madhavi Arora, economist at Edelweiss Securities.